Full Text of Novena Here. O glorious St. John of the Cross, through a pure desire of being like Jesus crucified, you longed for nothing so eagerly as to suffer, to be despised, and to be made little of by all; and your thirst after sufferings was so burning that your noble heart rejoiced in the midst of the cruelest torments and afflictions. Grant, I beseech you, O dear Saint, by the glory which your many sufferings have gained for you, to intercede for me and obtain from God for me a love of suffering, together with strength and grace to bear with firmness of mind all the trials and adversities which are the sure means to the happy attainment of all that awaits me in heaven. Dear Saint, from your most happy place in glory, hear, I beseech you, my prayers, so that after your example, full of love for the cross I may deserve to be your companion in glory. Amen. 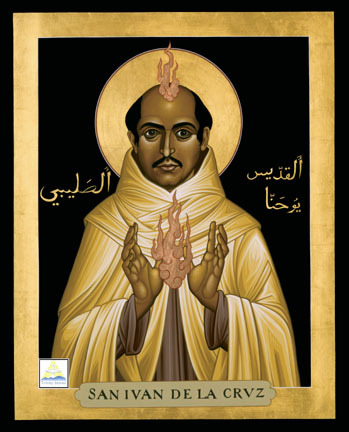 Blessed father St. John of the Cross, in you was joined the most profound humility to the most sublime knowledge of the ways of God. Obtain for me real humility of heart, making me love humiliation and contempt that, despairing worldly vanity, I may learn from you to esteem only God and heavenly things. Obtain for me also the special grace I ask through your intercession during this novena, if it be for the glory of God and for my salvation (make request). It says Seventh day: Humility but it says the day 6 Novena.